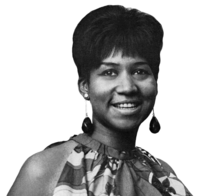 Aretha Louise FRANKLIN (naskiĝis la 25-an de marto 1942(nun 1942-03-25) en Memphis, Tennessee, mortis la 16-an de aŭgusto 2018 en Detrojto) estis usona kantistino. Fariĝinte renoma kantistino de Gospelo, soulo kaj Ritmenbluso (R&B), oni kromnomis ŝin "Reĝino de Soulo". 1967: I Never Loved a Man (The Way I Love You) kaj Aretha Arrives. 1968: Lady Soul kaj Aretha Now. 1970: This Girl's In Love With You. 1971: Young, Gifted and Black. 1973: Hey Now Hey (The Other Side of the Sky). 1974: With Everything I Feel in Me kaj Let Me in Your Life. 1991: What You See Is What You Sweat. 1998: A Rose Is Still A Rose. 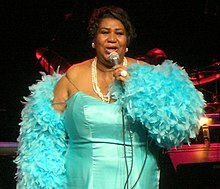 2011: Aretha: A Woman Falling Out of Love. 2014: Aretha Franklin Sings the Great Diva Classics. 2017: A Brand New Me. Ĉi tiu paĝo estis lastafoje redaktita je 15:53, 17 feb. 2019.